An honorable mention on our Top Craft E-Juice list, Cuttwood is a premium juice maker with 4 complex and layered flavor choices. Unicorn Milk is probably the most popular (natural strawberry and multiple creams), along with Boss Reserve (honey graham cereal with roasted nut clusters, milk and banana), Monster Melons (trifecta of mango, cantaloupe, and papaya) and Sugar Bear (cinnamon and milky cream). 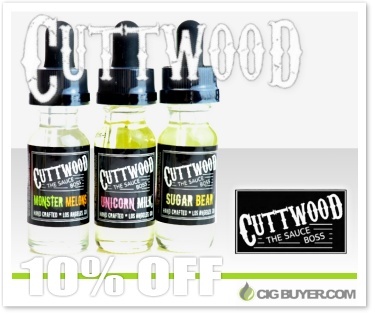 If you’re looking for the best, Cuttwood’s e-juice is right up there near the top! Boss Reserve – Golden honey graham cereal with roasted nut clusters, drenched in creamy milk and layered with sliced bananas. Monster Melons – A delectable combination of refreshing tropical flavors of mango, cantaloupe, and papaya. Sugar Bear – Indulge in perfect sweet balance of cinnamon and milky cream with Sugar Bear, and satisfy that craving for your favorite breakfast cereal. Unicorn Milk – A perfect blend of natural strawberry extract and four unique fresh creams.